Hollywood & Highland is both an intersection at the heart of Hollywood and the shopping complex, Hollywood & Highland Center at that location. There is so much to do at the intersection of Hollywood and Highland that you could easily spend a couple of days right there within walking distance. The Hollywood & Highland Center was the redevelopment project that was built up around Grauman's Chinese Theatre (now TCL Chinese Theatre) in 2001, sparking the renaissance of Hollywood as the center of LA glamour and nightlife. In addition to the Chinese Theatre with its Forecourt of the Stars, the intersection of Hollywood and Highland was already home to the Hollywood Walk of Fame, the historic Hollywood Roosevelt Hotel, the Hollywood Museum in the former Max Factor Building, the Hollywood Wax Museum, Guinness World Records Museum and Ripley's Believe It Or Not Odditorium with the Hollywood Bowl just up Highland. The Hollywood & Highland Center includes the Dolby Theatre, formerly known as the Kodak Theatre, a permanent home for the Academy Awards, and the Loews Hollywood Hotel as well as multiple levels of shopping, dining and entertainment options. The Babylon Courtyard at Hollywood & Highland is based on the ancient Babylon set from D.W. Griffith's 1916 epic "Intolerance." The columns topped with standing elephants and the archway over the viewing bridges are modeled after the film set. If you climb the left side of the stairs from Hollywood Blvd and the vendor carts aren't blocking the view, you can catch a glimpse of the Hollywood Sign through the Babylon archway as you come up the stairs. At the back of the Hollywood & Highland Center, the Babylon arch frames a series of open bridges on each floor. These viewing bridges with coin-operated telescopes look north to the famed view of the Hollywood Sign atop Mt. Lee and the surrounding Hollywood Hills. Colorfully tiled outdoor tables offer a pleasant place to take a break and people watch while enjoying a drink or a bite from surrounding restaurants and snack bars. Follow artist Erika Rothenburg's inlaid mosaic trail throughout the complex to read stories of The Road to Hollywood: How Some of Us Got Here. The most recent addition to the block is Madame Tussauds Wax Museum, which abuts Grauman's on the opposite side from the Dolby Theatre. Marilyn Monroe and a revolving cast of characters in the outdoor courtyard give you a taste of what's inside. On the sidewalk in front of Grauman's and the Hollywood & Highland Center, are costumed superheroes and cartoon characters providing a variety of photo opportunities. Some of the most beloved stars on the Hollywood Walk of Fame are also right out front. Among the famous actors, directors, and singers like Michael Jackson, Harrison Ford, and Stephen Spielberg, who have Walk of Fame stars at Hollywood & Highland, the kids will be happy to see Mickey Mouse and Kermit the Frog. Hollywood & Highland is as touristy as it gets, but that doesn't mean that celebrities stay away. 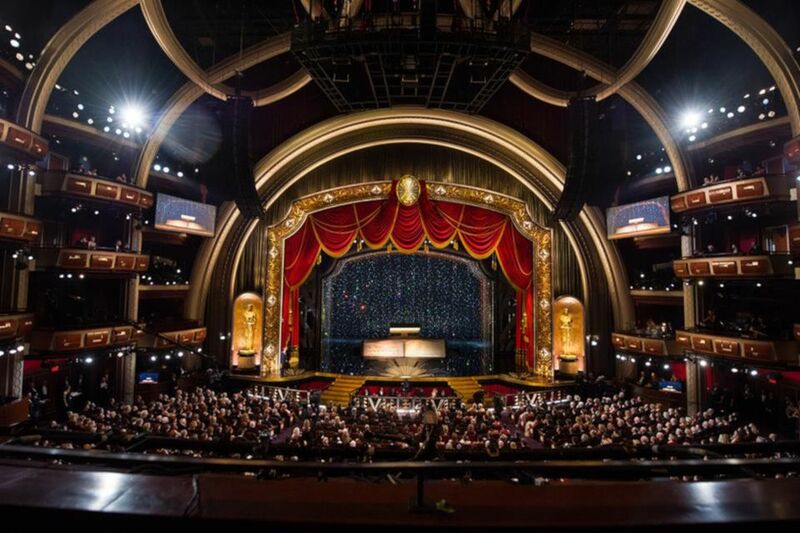 In addition to the prestigious Academy Awards, which virtually shuts down the block for a couple of days, including the underground Metro station, Grauman's Chinese Theater hosts frequent movie premieres. Companies close off the street for star-studded product-launching parties. The Jimmy Kimmel Live! show frequently tapes bits on the sidewalk in front of Hollywood & Highland and across the street in front of the Disney Entertainment Center, where the program tapes. It is not uncommon to run into a wide variety of shows taping on the sidewalk or all around the complex. There is so much to do at and near Hollywood & Highland that you could spend a couple days and not do it all, but most of the activities are very Hollywood kitsch. Just because it's a total tourist trap, doesn't mean it's not also fun if you get into the spirit of it. This page includes things you can do within the Hollywood & Highland complex. The next page has more activities nearby, followed by specific lists of shops, restaurants, clubs and entertainment venues. View the Hollywood Sign from the Viewing Bridges. Take a guided tour of Grauman's Chinese Theatre or the Dolby (formerly Kodak) Theatre. Visit Madame Tussauds Wax Museum and pose with the images of your favorite celebrities. See a movie at Grauman's Chinese Theatre. Go bowling at Lucky Strike Lanes bowling alley, restaurant and nightclub. Go dancing at OHM nightclub. Have a make-up consultation at Sephora. Build a Bear at the Build a Bear Workshop. Dine at any of the casual or fine dining restaurants. Get a room at the Loews Hollywood Hotel and make a night of it. Take a Tour - several tour companies, including Starline bus tours depart from Hollywood & Highland with their city and movie star homes tours. Redline walking tours also depart from Grauman's Chinese Theatre. Get your questions answered or book tours, tickets and dining reservations at the Visitor Information Center. Keep your eyes open for celebrity spotting at movie premieres and TV shows that tape at or near Hollywood & Highland. During the summer months, Hollywood & Highland hosts a variety of outdoor performances in the Babylon Courtyard including Tuesday Wine and Jazz evenings to benefit local charities. Continue to More Things to Do Near Hollywood and Highland. Beyond the Hollywood & Highland Center itself, there are plenty of other attractions within walking distance, near the famous intersection. Take the kids to a movie at El Capitan, followed by ice cream at the Disney Soda Fountain. See a live taping of Jimmy Kimmel Live! across the street at the Disney Entertainment Center. Stop in to the Hollywood Roosevelt Hotel, the original home of the Oscars, to dine, stay or just look. Visit the Hollywood Museum in the Max Factor Building for a look at some great Hollywood memorabilia. Be astounded by the Ripley's Believe it or Not Odditorium. See the biggest, smallest, mostest at the Guinness World of Records Museum. Visit Hollywood Wax Museum, a neighborhood staple long before Ms Tussaud came to town. See a play at the Stella Adler Theatre. Take a picnic to an outdoor concert at the Hollywood Bowl or the John Anson Ford Theatre, both up the hill off Highland Avenue. Dine at top Hollywood restaurants. Go drinking and/or dancing at top Hollywood bars and nightclubs. Take the "dinner and a show" shuttle, grab a cab or walk the mile to see a show at the glorious Pantages Theatre at Hollywood & Vine. 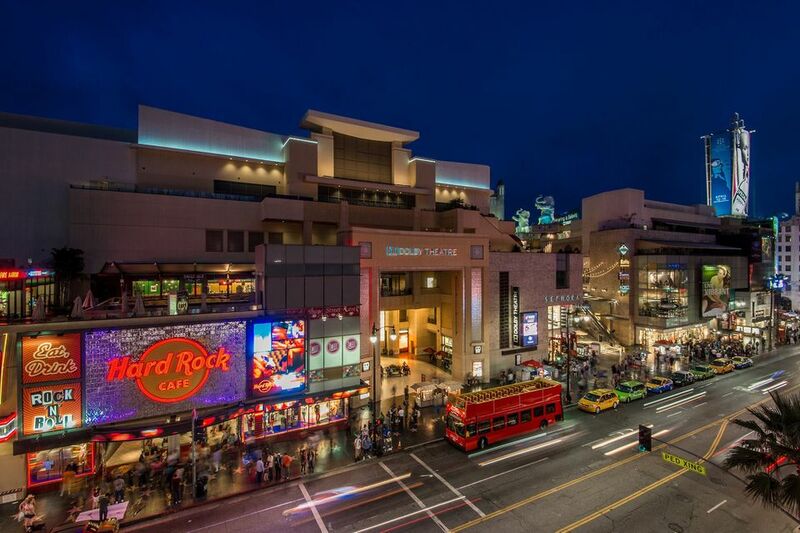 There are over 70 shops inside the Hollywood & Highland Center and more across the street. The Gap is the most visible store, on the outside corner facing both Hollywood Blvd and Highland Ave. Sephora also has prominent placement on Hollywood Boulevard, but the entrance is off the inner courtyard. Below are some of the other major shops at Hollywood & Highland Center. Tenants change often - the Virgin Megastore that was an anchor when the complex opened has been replaced by the Hard Rock Café - so check the website if you want to know if a particular store is still there. Outside the mall near the intersection of Hollywood and Highland you'll find American Apparel, H&M and Zara as well as a variety of souvenir and lingerie shops. You can get discounts at Hollywood & Highland venues by stopping by the Visitor Information Center and picking up The Elephant Card and coupon booklet. There are regular promotions that offer free gifts or tickets with shopping purchases, for example, 2 tickets to a show at the Pantages Theatre with a $250 purchase, or free shuttle to a show with dinner purchase. Sign up on the Hollywood & Highland the website for special deals; look for posters at the center or ask at Visitor Information for the latest offer. Hollywood restaurants come and go so fast that I can't keep up, so this list will probably be out of date before it goes live. You can find a list of current Hollywood & Highland restaurants on their website. Cabo Wabo Cantina for Sammy Hagar's beach Mexican food with Hollywood style on level four. California Pizza Kitchen - CPK is a popular casual dining restaurant at the back of the first level of Hollywood & Highland with a view of the Hollywood Sign. Cho Oishi sushi restaurant with a 30-foot sushi bar in the space that used to be Koji on level three. The Grill on Hollywood is a spin-off of the Beverly Hills staple The Grill on the Alley. The Hard Rock Café Hollywood Blvd moved into the space that was originally Virgin Music. Casual dining is set in an environment of rock n' roll memorabilia and touch screen exhibits. Check the website for the live music schedule. Lucky Strike Lanes - even if you're not bowling, you can stop by for dinner or happy hour. Preston at the Loews Hollywood Hotel is a mid-century modern venue specializing in California-fresh cuisine. Stop by for Sunday Jazz Brunch. H2 Kitchen and Bar at Loews also serves food. There are two nightclubs on the premises, as well as other venues offering evening entertainment. Ohm Nightclub, located on level 4, is a 30,000 square foot dance club with multiple dance floors on different levels. Lucky Strike Lanes is a bowling alley/nightclub/restaurant with a DJ on the weekends. It's a happening spot for happy hour cocktails. Across the street at the Hollywood Roosevelt Hotel, you'll find Tropicana, an exclusive pool-side bar and lounge, Teddy's nightclub, The Spare Room gaming parlour and cocktail lounge and the Lobby Bar. The Dolby Theatre - in addition to being home to the Academy Awards, the former Kodak, now Dolby Theatre has hosted various concerts and TV show tapings including American Idol. The Babylon Courtyard - outdoor music concerts are scheduled throughout the summer and occasionally during the rest of the year. David Arquette's Beacher's Madhouse burlesque theatre is across the street at the Hollywood Roosevelt Hotel. The Jimmy Kimmel Live! studio taping and concert stage are across the street. The late night interview show is taped in the Disney Entertainment Center with musical guests often performing on an outdoor stage in the parking lot behind the Disney Entertainment Center. Tickets are free. There are separate ticket lines for the studio audience and the concert stage audience. Tickets can be ordered online through www.1iota.com. More on Attending a TV Show Taping. The Hard Rock Café Hollywood Boulevard has live music on select days. See their calendar for the current schedule. The Loews Hollywood Hotel has live music for Indie Thursdays in the Lobby Bar and Sunday Champagne Jazz Brunch at Preston Restaurant. The Stella Adler Theatre is located half a block east of Hollywood & Highland. The theatre hosts productions by students of the Stella Adler Academy of Acting and Theatre as well as guest companies who rent the space for performances. TCL Chinese Theatre is part of the Hollywood & Highland complex. The original Grauman's Chinese is primarily used for red carpet movie premieres and is otherwise open for tours. Chinese 6, inside the mall on the 2nd level, has 6 additional movie screens that show current movies. El Capitan Theatre across the street shows the latest Disney releases, accompanied by live character performances or related prop exhibits in another historic movie palace. A half-block east, the Egyptian Theatre, another Sid Grauman masterpiece, is the home of American Cinemateque, which screens a variety of themed film festivals, classic movies, foreign films and art films. They frequently have guest appearances by actors, directors and others involved in the creation of films they are screening. One of the greatest attractions at Hollywood & Highland is its massive underground parking garage, where you can park for 2 hours for just $2 with validation or all day for a $13 maximum. This makes it a pretty good base for exploring Hollywood. There are also other parking options in the neighborhood. You can get that validation by shopping or dining at any Hollywood & Highland business or just stop by the Visitor Information Center near the Dolby Theatre entrance off Hollywood Blvd. the Visitor Information staff can also help you with maps, tours, restaurants and hotel reservations and other information. If you're going to a show or have a dinner reservation, allow plenty of time to get in and out of the structure. Saturday night from 7 pm to 3 am is rush hour. For ease in getting out of the structure, prepay your parking at the cashier window on level 1 (if it's open) or one of the automated machines before going to your car. The Metro Red Line stops at the Hollywood & Highland Metro Station connecting to Universal Studios and North Hollywood to the north and Downtown Los Angeles to the east with connections to Pasadena via the Gold Line, Long Beach via the Blue Line and LAX (not recommended) via the Blue and Green Line. The entrance to the Metro is under the complex, but you can't get there from the inside elevators. You have to access the Metro station from the front of the center on Hollywood Boulevard, near the Gap. Various bus lines also stop in front of Hollywood & Highland Center.